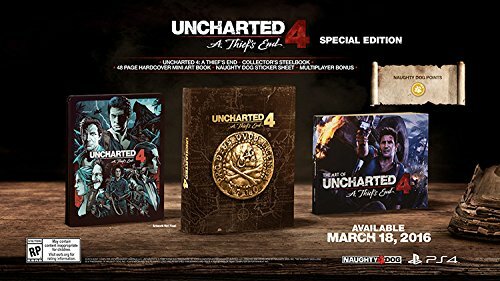 Uncharted 4 Collector's Edition — GamingWithSwag.com - Dads By Day, Gamers By Night. With all the best Christmas season game releases out of the way we can start to look at the hot games dropping in early 2016. The biggest title is certainly Uncharted 4 which hits stores March 18th exclusively on the PS4. By this point the giant collector's edition that came with a Statuette is sold out from many retailers, but a 79.99 edition is available which has many of the options from the rare edition and you save 40 bucks by skipping on the statue which was somewhat awkwardly posed anyway. You still get the Steelbook case and 48 page booklet, it also comes with stickers and some points to spend unlocking multiplayer content. If you preorder you get some other perks to redeem and a Gold Weapon skin, and some retailers have bonus preorder content like Amazon's exclusive snow camo weapon's skin which you can apply to any weapon and a desert outfit. If you opt for Gamestop they have their own exclusives although I must admit I am not as excited by them..